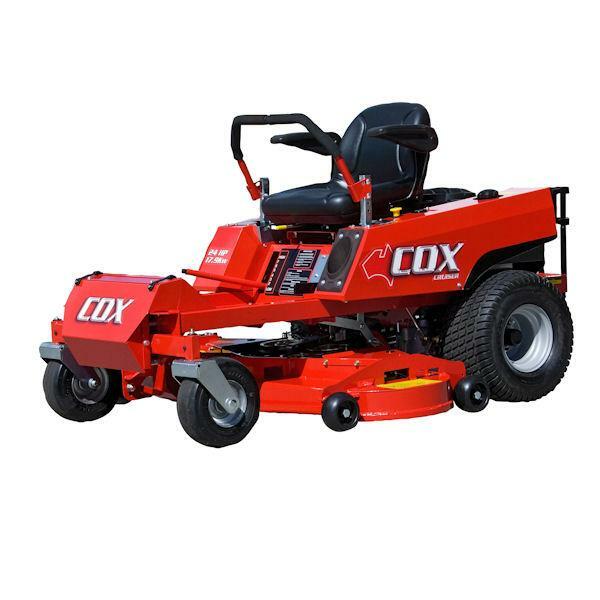 The Cox Cruiser zero turn ride on mower will turn on its own length, thanks to the twin hydro-gear transmissions. Just flick your control levers left or right and you’ll swing around trees and garden beds in just one pass, with minimum effort. This zero turn mower features either a Briggs & Stratton Intek powered or V-Twin Honda engine, plus twin, 9 litre fuel tanks means you can mow confidently, for hours on end. The Cruiser comes with a fully fabricated 42″ (1055mm) or 48″ (1220mm)cutter deck, which has a 8mm reinforced skirt to protect against impact damage. The bearing housings and pulleys are made out of cast iron to ensure longevity. The large turf saver tyres minimises ground impression on soft and damp turf. When you have finished mowing, all you have to do is just snap on a standard hose fitting and the underside of your deck will be cleared of accumulated grass clippings. You’ve also got the benefit of the slide adjustable high back seat complete with armrests for operator comfort.